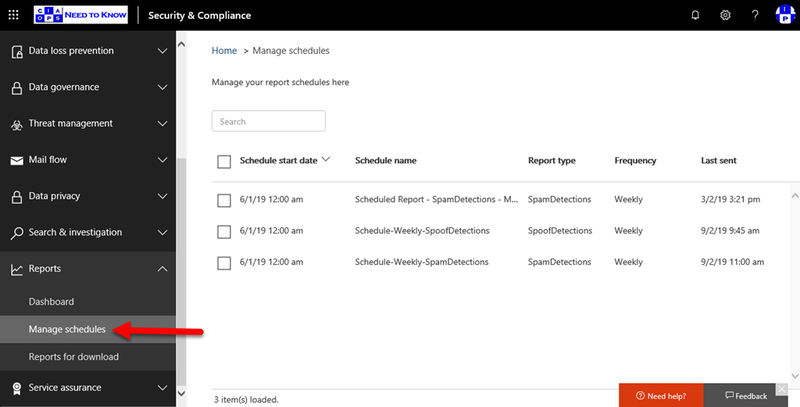 If you go into the Microsoft 365 Security portal and locate the Reports option from the menu on the left and expand it, you should find the Dashboard option. 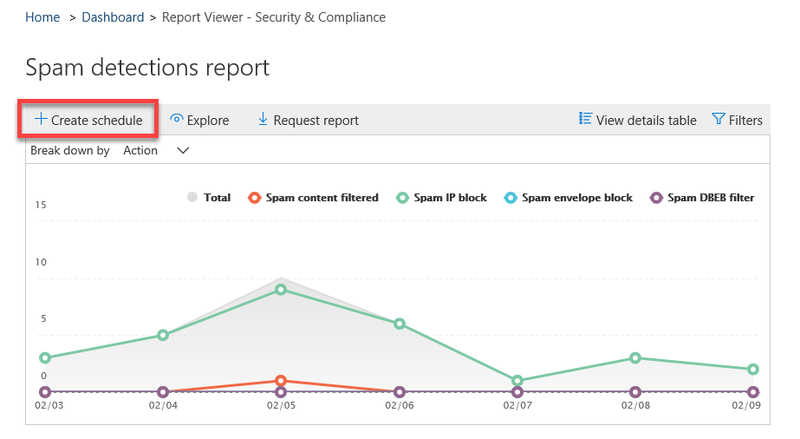 This option, when selected, will show a range of reports like that shown above. You can get more details by simply selecting the body of the tile you wish to view. 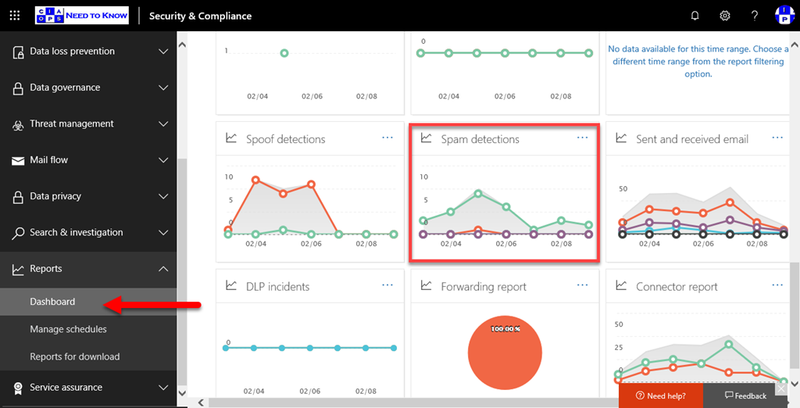 Here, I’ll select the Spam detections tile to get further information. 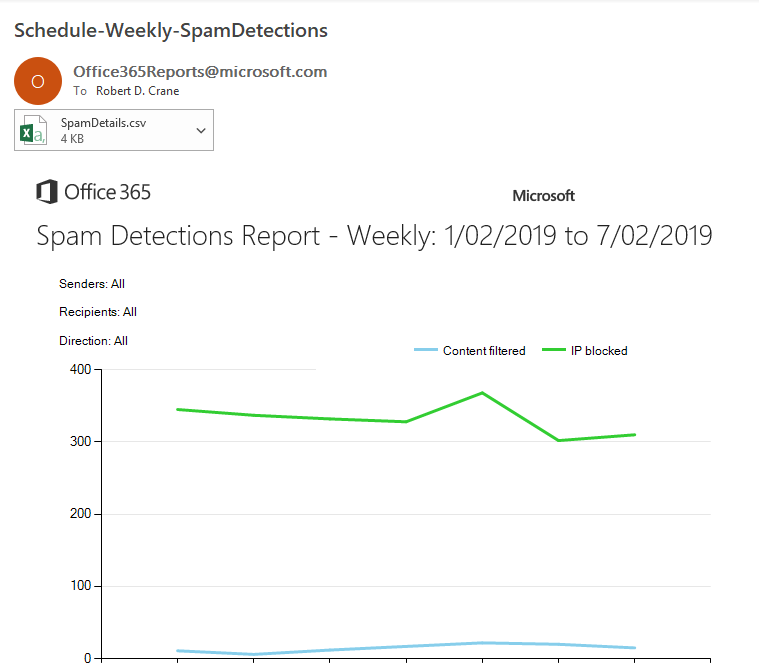 You’ll now see a more focused report but you’ll also notice that many graphs have the Create schedule in the top right hand corner as shown. 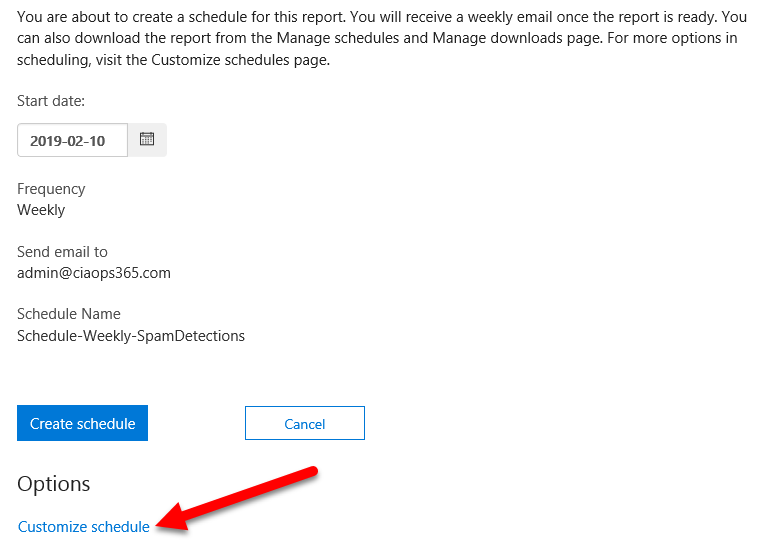 Selecting this allows you to schedule a report to be delivered via email. 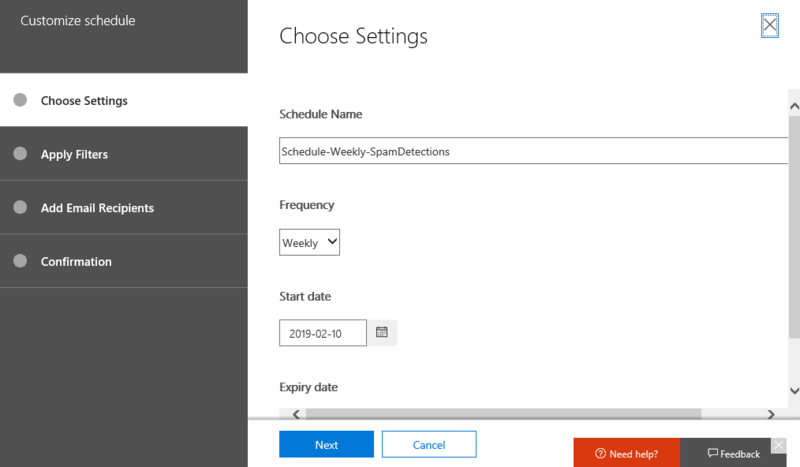 By selecting Create schedule you should see a tile appear from the right with the above options that you can configure. If you scroll down to the bottom of the window you will see that there is a Customize schedule option as shown above. Selecting this will give you much greater options as shown above. 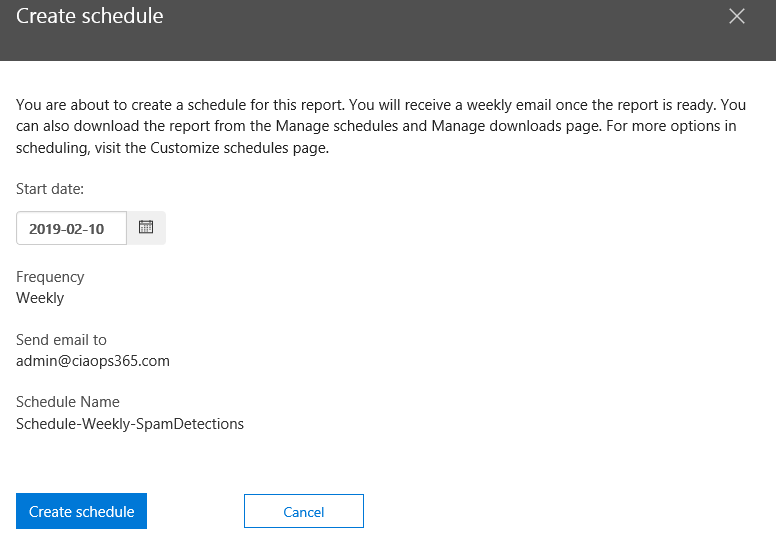 Once you have saved your schedule, you will then receive a regular email like that show above with the report you configured. You’ll note that there is also a CSV file attached that you can use for further analysis. You can adjust the schedules you have configured via the Manage schedules option as shown above. As yet, I haven’t found an easy way to configure these using PowerShell. There is way using the Microsoft Graph but that requires some setup so I’m trying to find a way just to use a pure script. If I work that out, I’ll post an article on how to do it. Till then, you’ll just have to manually go in a select and configure the reports you wish to receive regularly.